Beethoven was the grandson of a musician of Flemish origin named Lodewijk van Beethoven (1712–73). Beethoven was named after his grandfather, as Lodewijk is the Dutch cognate of Ludwig. Beethoven’s grandfather was employed as a bass singer at the court of the Elector of Cologne, rising to become Kapellmeister (music director). He had one son, Johann van Beethoven (1740–1792), who worked as a tenor in the same musical establishment, also giving lessons on piano and violin to supplement his income. Johann married Maria Magdalena Keverich in 1767; she was the daughter of Johann Heinrich Keverich, who had been the head chef at the court of the Archbishopric of Trier. Beethoven was born of this marriage in Bonn; he was baptised in a Roman Catholic service on 17 December 1770, and was probably born the previous day, 16 December. Children of that era were usually baptised the day after birth, and it is known that Beethoven’s family and his teacher Johann Albrechtsberger celebrated his birthday on 16 December. While this evidence supports the case for 16 December 1770 as Beethoven’s date of birth, it cannot be stated with certainty, as there is no documentary evidence of it (only his baptismal record survives). Of the seven children born to Johann van Beethoven, only the second-born, Ludwig, and two younger brothers survived infancy. Caspar Anton Carl was born on 8 April 1774, and Nikolaus Johann, the youngest, was born on 2 October 1776. Beethoven’s first music teacher was his father. A traditional belief concerning Johann van Beethoven is that he was a harsh instructor, and that the child Beethoven, “made to stand at the keyboard, was often in tears.” However, the New Grove indicates that there is no solid documentation to support it, and asserts that “speculation and myth-making have both been productive.” Beethoven had other local teachers as well: the court organist Gilles van den Eeden (d. 1782), Tobias Friedrich Pfeiffer (a family friend, who taught Beethoven piano), and a relative, Franz Rovantini (violin and viola). His musical talent manifested itself early. Johann, aware of Leopold Mozart‘s successes in this area (with son Wolfgang and daughter Nannerl), attempted to exploit his son as a child prodigy, claiming that Beethoven was six (he was seven) on the posters for Beethoven’s first public performance in March 1778. Some time after 1779, Beethoven began his studies with his most important teacher in Bonn, Christian Gottlob Neefe, who was appointed the Court’s Organist in that year. Neefe taught Beethoven composition, and by March 1783 had helped him write his first published composition: a set of keyboard variations (WoO 63). Beethoven soon began working with Neefe as assistant organist, first on an unpaid basis (1781), and then as paid employee (1784) of the court chapel conducted by the Kapellmeister Andrea Luchesi. His first three piano sonatas, named “Kurfürst” (“Elector”) for their dedication to the Elector Maximilian Frederick, were published in 1783. Maximilian Frederick, who died in 1784, not long after Beethoven’s appointment as assistant organist, had noticed Beethoven’s talent early, and had subsidised and encouraged the young Beethoven’s musical studies. 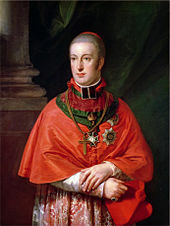 Maximilian Frederick’s successor as the Elector of Bonn was Maximilian Franz, the youngest son of Empress Maria Theresa of Austria, and he brought notable changes to Bonn. Echoing changes made in Vienna by his brother Joseph, he introduced reforms based on Enlightenment philosophy, with increased support for education and the arts. The teenage Beethoven was almost certainly influenced by these changes. He may also have been strongly influenced at this time by ideas prominent in freemasonry, as Neefe and others around Beethoven were members of the local chapter of the Order of the Illuminati. In March 1787 Beethoven traveled to Vienna (it is unknown at whose expense) for the first time, apparently in the hope of studying with Wolfgang Mozart. The details of their relationship are uncertain, including whether or not they actually met. After just two weeks there Beethoven learned that his mother was severely ill, and he was forced to return home. His mother died shortly thereafter, and the father lapsed deeper into alcoholism. As a result, Beethoven became responsible for the care of his two younger brothers, and he spent the next five years in Bonn. Beethoven was introduced to a number of people who became important in his life in these years. Franz Wegeler, a young medical student, introduced him to the von Breuning family (one of whose daughters Wegeler eventually married). 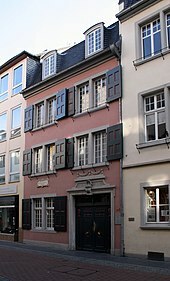 Beethoven was often at the von Breuning household, where he was exposed to German and classical literature, and where he also gave piano instruction to some of the children. The von Breuning family environment was also less stressful than his own, which was increasingly dominated by his father’s strict control and descent into alcoholism. It is also in these years that Beethoven came to the attention of Count Ferdinand von Waldstein, who became a lifelong friend and financial supporter. In 1789 he obtained a legal order by which half of his father’s salary was paid directly to him for support of the family. He also contributed further to the family’s income by playing viola in the court orchestra. This familiarised Beethoven with a variety of operas, including three of Mozart‘s operas performed at court in this period. He also befriended Anton Reicha, a flautist and violinist of about his own age who was the conductor’s nephew. With the Elector’s help, Beethoven moved to Vienna in 1792. He was probably first introduced to Joseph Haydn in late 1790, when the latter was traveling to London and stopped in Bonn around Christmas time. They met in Bonn on Haydn’s return trip from London to Vienna in July 1792, and it is likely that arrangements were made at that time for Beethoven to study with the old master. In the intervening years, Beethoven composed a significant number of works (none were published at the time, and most are now listed as works without opus) that demonstrated a growing range and maturity of style. Musicologists have identified a theme similar to those of his third symphony in a set of variations written in 1791. 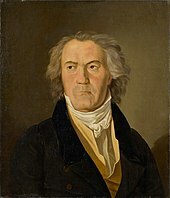 Beethoven left Bonn for Vienna in November 1792, amid rumors of war spilling out of France, and learned shortly after his arrival that his father had died. Count Waldstein in his farewell note to Beethoven wrote: “Through uninterrupted diligence you will receive Mozart’s spirit through Haydn’s hands.” Beethoven responded to the widespread feeling that he was a successor to the recently deceased Mozart over the next few years by studying that master’s work and writing works with a distinctly Mozartean flavor. Beethoven did not immediately set out to establish himself as a composer, but rather devoted himself to study and to playing the piano. Working under Haydn’s direction, he sought to master counterpoint. He also took violin lessons from Ignaz Schuppanzigh. Early in this period, he also began receiving occasional instruction from Antonio Salieri, primarily in Italian vocal composition style; this relationship persisted until at least 1802, and possibly 1809. With Haydn’s departure for England in 1794, Beethoven was expected by the Elector to return home. He chose instead to remain in Vienna, continuing his instruction in counterpoint with Johann Albrechtsberger and other teachers. Although his stipend from the Elector expired, a number of Viennese noblemen had already recognised his ability and offered him financial support, among them Prince Joseph Franz Lobkowitz, Prince Karl Lichnowsky, and Baron Gottfried van Swieten. By 1793, Beethoven established a reputation as an improviser in the salons of the nobility, often playing the preludes and fugues of J. S. Bach‘s Well-Tempered Clavier. His friend Nikolaus Simrock had also begun publishing his compositions; the first are believed to be a set of variations (WoO 66). Beethoven spent much of 1794 composing. By 1793, he had established a reputation in Vienna as a piano virtuoso, but he apparently withheld works from publication so that their publication in 1795 would have greater impact. Beethoven’s first public performance in Vienna was in March 1795, a concert in which he debuted a piano concerto. It is uncertain whether this was the First or Second, as documentary evidence is unclear, and both concertos were in a similar state of near-completion (neither was completed or published for several years). Shortly after this performance, he arranged for the publication of the first of his compositions to which he assigned an opus number, the piano trios of Opus 1. These works were dedicated to his patron Prince Lichnowsky, and were a financial success; Beethoven’s profits were nearly sufficient to cover his living expenses for a year. Between 1798 and 1802 Beethoven tackled what he considered the pinnacles of composition: the string quartet and the symphony. With the composition of his first six string quartets (Op. 18) between 1798 and 1800 (written on commission for, and dedicated to, Prince Lobkowitz), and their publication in 1801, along with premieres of the First and Second Symphonies in 1800 and 1802, Beethoven was justifiably considered one of the most important of a generation of young composers following after Haydn and Mozart. He continued to write in other forms, turning out widely known piano sonatas like the “Pathétique” sonata (Op. 13), which Cooper describes as “surpass[ing] any of his previous compositions, in strength of character, depth of emotion, level of originality, and ingenuity of motivic and tonal manipulation.” He also completed his Septet (Op. 20) in 1799, which was one of his most popular works during his lifetime. While Mozart and Haydn were undeniable influences (for example, Beethoven’s quintet for piano and winds is said to bear a strong resemblance to Mozart’s work for the same configuration, albeit with his own distinctive touches), other composers like Muzio Clementi were also stylistic influences. Beethoven’s melodies, musical development, use of modulation and texture, and characterization of emotion all set him apart from his influences, and heightened the impact some of his early works made when they were first published. By the end of 1800 Beethoven and his music were already much in demand from patrons and publishers. In May of 1799, Beethoven gave piano lessons to the daughters of Hungarian Countess Anna Brunsvik. While this round of lessons lasted less than one month, Beethoven formed a relationship with the older daughter Josephine that has been the subject of speculation ever since. Shortly after these lessons, she married Count Josef Deym, and Beethoven was a regular visitor at their house, giving lessons and playing at parties. While her marriage was by all accounts unhappy, the couple had four children, and her relationship with Beethoven did not intensify until after Deym died in 1804. Beethoven had few other students. From 1801 to 1805, he tutored Ferdinand Ries, who went on to become a composer and later wrote Beethoven remembered, a book about their encounters. The young Carl Czerny studied with Beethoven from 1801 to 1803. Czerny went on to become a renowned music teacher himself, taking on Franz Liszt as one of his students, and gave the Vienna premiere of Beethoven’s fifth piano concerto (the “Emperor”) in 1812. Beethoven’s compositions between 1800 and 1802 were dominated by two works, although he continued to produce smaller works, including the Moonlight Sonata. In the spring of 1801 he completed The Creatures of Prometheus, a ballet. The work was such a success that it received numerous performances in 1801 and 1802, and Beethoven rushed to publish a piano arrangement to capitalise on its early popularity. In the spring of 1802 he completed the Second Symphony, intended for performance at a concert that was eventually cancelled. The symphony received its premiere at a subscription concert in April 1803 at the Theater an der Wien, where Beethoven had been appointed as composer in residence. In addition to the Second Symphony, the concert also featured the First Symphony, the Third Piano Concerto, and the oratorio Christ on the Mount of Olives. While reviews were mixed, the concert was a financial success; Beethoven was able to charge three times the cost of a typical concert ticket. Beethoven’s business dealings with publishers also began to improve in 1802 when his brother Carl, who had previously assisted him more casually, began to assume a larger role in the management of his affairs. In addition to negotiating higher prices for recently composed works, Carl also began selling some of Beethoven’s earlier unpublished works, and encouraged Beethoven (against the latter’s preference) to also make arrangements and transcriptions of his more popular works for other instrument combinations. Beethoven acceded to these requests, as he could not prevent publishers from hiring others to do similar arrangements of his works. Around 1796, Beethoven began to lose his hearing. He suffered a severe form of tinnitus, a “ringing” in his ears that made it hard for him to perceive and appreciate music; he also avoided conversation. The cause of Beethoven’s deafness is unknown, but it has variously been attributed to syphilis, lead poisoning, typhus, auto-immune disorder (such as systemic lupus erythematosus), and even his habit of immersing his head in cold water to stay awake. The explanation, from the autopsy of the time, is that he had a “distended inner ear” which developed lesions over time. 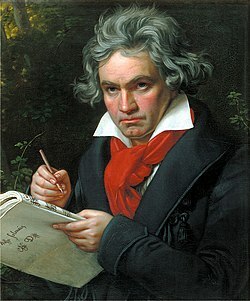 Because of the high levels of lead found in samples of Beethoven’s hair, that hypothesis has been extensively analyzed. While the likelihood of lead poisoning is very high, the deafness associated with it seldom takes the form that Beethoven exhibited. As early as 1801, Beethoven wrote to friends describing his symptoms and the difficulties they caused in both professional and social settings (although it is likely some of his close friends were already aware of the problems). Beethoven, on the advice of his doctor, lived in the small Austrian town of Heiligenstadt, just outside Vienna, from April to October 1802 in an attempt to come to terms with his condition. There he wrote his Heiligenstadt Testament, which records his resolution to continue living for and through his art. Over time, his hearing loss became profound: there is a well-attested story that, at the end of the premiere of his Ninth Symphony, he had to be turned around to see the tumultuous applause of the audience; hearing nothing, he wept. Beethoven’s hearing loss did not prevent his composing music, but it made playing at concerts—a lucrative source of income—increasingly difficult. After a failed attempt in 1811 to perform his own Piano Concerto No. 5 (the “Emperor”), which was premiered by his student Carl Czerny, he never performed in public again. A large collection of Beethoven’s hearing aids such as a special ear horn can be viewed at the Beethoven House Museum in Bonn, Germany. Despite his obvious distress, Carl Czerny remarked that Beethoven could still hear speech and music normally until 1812. 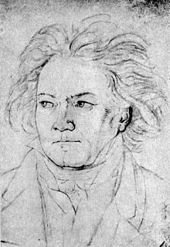 By 1814 however, Beethoven was almost totally deaf, and when a group of visitors saw him play a loud arpeggio of thundering bass notes at his piano remarking, “Ist es nicht schön?” (Is it not beautiful? ), they felt deep sympathy considering his courage and sense of humor (he lost the ability to hear higher frequencies first). As a result of Beethoven’s hearing loss, a unique historical record has been preserved: his conversation books. Used primarily in the last ten or so years of his life, his friends wrote in these books so that he could know what they were saying, and he then responded either orally or in the book. The books contain discussions about music and other matters, and give insights into his thinking; they are a source for investigation into how he felt his music should be performed, and also his perception of his relationship to art. Unfortunately, 264 out of a total of 400 conversation books were destroyed (and others were altered) after Beethoven’s death by Anton Schindler, in his attempt to paint an idealised picture of the composer. Perhaps Beethoven’s most important aristocratic patron was Archduke Rudolph, the youngest son of Emperor Leopold II, who in 1803 or 1804 began to study piano and composition with Beethoven. The cleric (Cardinal-Priest) and the composer became friends, and their meetings continued until 1824. Beethoven dedicated 14 compositions to Rudolph, including the Archduke Trio (1811) and his great Missa Solemnis (1823). Rudolph, in turn, dedicated one of his own compositions to Beethoven. The letters Beethoven wrote to Rudolph are today kept at the Gesellschaft der Musikfreunde in Vienna. In the Autumn of 1808, after having been rejected for a position at the royal theatre, Beethoven received an offer from Napoleon‘s brother Jérôme Bonaparte, then king of Westphalia, for a well-paid position as Kapellmeister at the court in Cassel. To persuade him to stay in Vienna, the Archduke Rudolph, Prince Kinsky and Prince Lobkowitz, after receiving representations from the composer’s friends, pledged to pay Beethoven a pension of 4000 florins a year. Only Archduke Rudolph paid his share of the pension on the agreed date. Kinsky, immediately called to duty as an officer, did not contribute and soon died after falling from his horse. Lobkowitz stopped paying in September 1811. 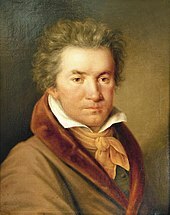 No successors came forward to continue the patronage, and Beethoven relied mostly on selling composition rights and a small pension after 1815. The effects of these financial arrangements were undermined to some extent by war with France, which caused significant inflation when the government printed money to fund its war efforts. Beethoven’s return to Vienna from Heiligenstadt was marked by a change in musical style, now recognised as the start of his “Middle” or “Heroic” period. According to Carl Czerny, Beethoven said, “I am not satisfied with the work I have done so far. From now on I intend to take a new way.” This “Heroic” phase was characterised by a large number of original works being composed on a grand scale. The first major work employing this new style was the Third Symphony in E flat, known as the “Eroica.” While other composers had written symphonies with implied programs, or stories, this work was longer and larger in scope than any previously written symphony. When it premiered in early 1805 it received a mixed reception, with some listeners objecting to its length or failing to understand its structure, while others viewed it as another masterpiece. Beethoven composed highly ambitious works throughout the Middle period, often heroic in tone, which extended the scope of the classical musical language Beethoven had inherited from Haydn and Mozart. The Middle period work includes the Third through Eighth Symphonies, the string quartets 7–11, the “Waldstein” and “Appassionata” piano sonatas, Christ on the Mount of Olives, the opera Fidelio, the Violin Concerto and many other compositions. During this time Beethoven earned his living from the sale and performance of his work, and from the continuing support of wealthy patrons. His position at the Theater an der Wien was terminated when the theater changed management in early 1804, and he was forced to move temporarily to the suburbs of Vienna with his friend Stephan von Breuning. This slowed work on Fidelio, his largest work to date, for a time. It was delayed again by the Austrian censor, and finally premiered in November 1805 to houses that were nearly empty because of the French occupation of the city. In addition to being a financial failure, this version of Fidelio was also a critical failure, and Beethoven began revising it. The string quartets composed during the Middle period are Op. 59 no 1, Op 59 no 2, Op 59 no 3 (The Razumowski quartets), Op. 74 (the Harp) and Op 95. Beethoven’s publisher said that the world was not ready for the middle quartets. The slow movement of Op. 59 no 2 has been described as the closest Beethoven got to heaven. Even Beethoven said that the Op. 95 quartet was not suitable for public performance. The work of the Middle period established Beethoven’s reputation as a great composer. In a review from 1810, he was enshrined by E. T. A. Hoffmann as one of the three great “Romantic” composers; Hoffman called Beethoven’s Fifth Symphony “one of the most important works of the age.” A particular trauma for Beethoven occurred during this period in May 1809, when the attacking forces of Napoleon bombarded Vienna. According to Ferdinand Ries, Beethoven, very worried that the noise would destroy what remained of his hearing, hid in the basement of his brother’s house, covering his ears with pillows. He was composing the “Emperor” Concerto at the time. Beethoven met Giulietta Guicciardi in about 1800 through the Brunsvik family. His mutual love-relationship with Guicciardi is mentioned in a November 1801 letter to his boyhood friend, Franz Wegeler. Beethoven dedicated to Giulietta his Sonata No. 14, popularly known as the “Moonlight” Sonata. Marriage plans were thwarted by Giulietta’s father and perhaps Beethoven’s common lineage. In 1803 she married Count Wenzel Robert von Gallenberg (1783–1839), himself an amateur composer. Beethoven’s relationship with Josephine Deym notably deepened after the death of her first husband in 1804. There is some evidence that Beethoven may have proposed to her, at least informally. While his attract was apparently reciprocated, she, with some regret, turned him down, and their relationship effectively ended in 1807. She cited her “duty,” an apparent reference to the fact that she was born of nobility and he was a commoner. 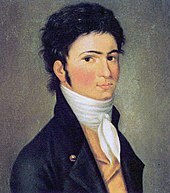 It is also likely that he considered proposing (whether he actually did or not is unknown) to Therese Malfatti, the dedicatee of “Für Elise” in 1810; his common status may also have interfered with those plans. In the spring of 1811 Beethoven became seriously ill, suffering headaches and bad fevers. On the advice of his doctor, he spent six weeks in the Bohemian spa town of Teplitz. The following winter, which was dominated by work on the Seventh symphony, he was again ill, and decided to spend the summer of 1812 at Teplitz. It is likely that he was at Teplitz when he wrote three love letters to an “Immortal Beloved.” While the identity of the intended recipient is an ongoing subject of debate, the most likely candidate, according to what is known about people’s movements and the contents of the letters, is Antonie Brentano, a married woman with whom he had begun a friendship in 1810. Beethoven traveled to Karlsbad in late July, where he stayed in the same guesthouse as the Brentanos. After traveling with them for a time, he returned to Teplitz, where after another bout of gastric illness, he left for Linz to visit his brother Johann. Beethoven’s visit to his brother was made in an attempt to end the latter’s immoral cohabitation with Therese Obermayer, a woman who already had an illegitimate child. He was unable to convince Johann to end the relationship, so he appealed to the local civic and religious authorities. The end result of Beethoven’s meddling was that Johann and Therese married on 9 November. In early 1813 Beethoven apparently went through a difficult emotional period, and his compositional output dropped for a time. Historians have suggested a variety of causes, including his lack of success at romance. His personal appearance, which had generally been neat, degraded, as did his manners in public, especially when dining. Some of his (married) desired romantic partners had children (leading to assertions among historians of Beethoven’s possible paternity), and his brother Carl was seriously ill. Beethoven took care of his brother and his family, an expense that he claimed left him penniless. He was unable to obtain a date for a concert in the spring of 1813, which, if successful, would have provided him with significant funds. Beethoven was finally motivated to begin significant composition again in June 1813, when news arrived of the defeat of one of Napoleon’s armies at Vitoria, Spain, by a coalition of forces under the Duke of Wellington. This news stimulated him to write the battle symphony known as Wellington’s Victory. It premiered on 8 December at a charity concert for victims of the war along with his Seventh Symphony. The work was a popular hit, likely because of its programmatic style that was entertaining and easy to understand. It received repeat performances at concerts Beethoven staged in January and February 1814. Beethoven’s renewed popularity led to demands for a revival of Fidelio, which, in its third revised version, was also well-received when it opened in July. That summer he also composed a piano sonata for the first time in five years (No. 27, Opus 90). This work was in a markedly more Romantic style than his earlier sonatas. He was also one of many composers who produced music in a patriotic vein to entertain the many heads of state and diplomats that came to the Congress of Vienna that began in November 1814. 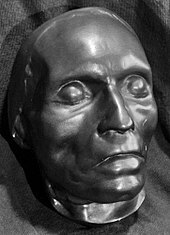 His output of songs included his only song cycle, “An die ferne Geliebte,” and the extraordinarily expressive, but almost incoherent, “An die Hoffnung” (Opus 94). Between 1815 and 1817 Beethoven’s output dropped again. Part of this Beethoven attributed to a lengthy illness (he called it an “inflammatory fever”) that afflicted him for more than a year, starting in October 1816. Biographers have speculated on a variety of other reasons that also contributed to the decline in creative output, including the difficulties in the personal lives of his would-be paramours and the harsh censorship policies of the Austrian government. The illness and death of his brother Carl from consumption likely also played a role. Carl had been ill for some time, and Beethoven spent a small fortune in 1815 on his care. 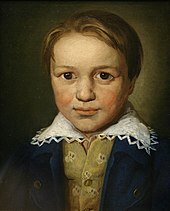 When he finally died on 15 November 1815, Beethoven immediately became embroiled in a protracted legal dispute with Carl’s wife Johanna over custody of their son Karl, then nine years old. Beethoven, who considered Johanna an unfit parent because of her morals (she had an illegitimate child by a different father before marrying Carl, and had been convicted of theft) and financial management, had successfully applied to Carl to have himself named sole guardian of the boy; but a late codicil to Carl’s will gave him and Johanna joint guardianship. 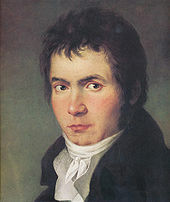 While Beethoven was successful at having his nephew removed from her custody in February 1816, the case was not fully resolved until 1820, and he was frequently preoccupied by the demands of the litigation and seeing to the welfare of the boy, whom he first placed in a private school. The custody fight brought out the very worst aspects of Beethoven’s character; in the lengthy court cases Beethoven stopped at nothing to ensure that he achieved this goal, and even stopped composing for long periods. The Austrian court system had one court for the nobility, The R&I Landrechte, and another for commoners, The Civil Court of the Magistrate. Beethoven disguised the fact that the Dutch “van” in his name did not denote nobility as does the German “von,” and his case was tried in the Landrechte. Owing to his influence with the court, Beethoven felt assured of a favorable outcome. Beethoven was awarded sole guardianship. While giving evidence to the Landrechte, however, Beethoven inadvertently admitted that he was not nobly born. The case was transferred to the Magistracy on 18 December 1818, where he lost sole guardianship. Beethoven appealed, and regained custody of Karl. Johanna’s appeal for justice to the Emperor was not successful: the Emperor “washed his hands of the matter.” Beethoven stopped at nothing to blacken her name, as can be read in surviving court papers. During the years of custody that followed, Beethoven attempted to ensure that Karl lived to the highest of moral standards. His overbearing manner and frequent interference in his nephew’s life, especially as he grew into a young man, apparently drove Karl to attempt suicide on 31 July 1826 by shooting himself in the head. He survived, and was brought to his mother’s house, where he recuperated. He and Beethoven reconciled, but Karl was insistent on joining the army, and last saw Beethoven in early 1827. Beethoven began a renewed study of older music, including works by J. S. Bach and Handel, that were then being published in the first attempts at complete editions. He composed the Consecration of the House Overture, which was the first work to attempt to incorporate his new influences. But it is when he returned to the keyboard to compose his first new piano sonatas in almost a decade, that a new style, now called his “late period,” emerged. The works of the late period are commonly held to include the last five piano sonatas and the Diabelli Variations, the last two sonatas for cello and piano, the late quartets (see below), and two works for very large forces: the Missa Solemnis and the Ninth Symphony. By early 1818 Beethoven’s health had improved, and his nephew had moved in with him in January. On the downside, his hearing had deteriorated to the point that conversation became difficult, necessitating the use of conversation books. His household management had also improved somewhat; Nanette Streicher, who had assisted in his care during his illness, continued to provide some support, and he finally found a decent cook. His musical output in 1818 was still somewhat reduced, but included song collections and the Hammerklavier Sonata, as well as sketches for two symphonies that eventually coalesced into the large-scale Ninth Symphony. In 1819 he was again preoccupied by the legal processes around Karl, and began work on the Diabelli Variations and the Missa Solemnis. For the next few years he continued to work on the Missa, composing piano sonatas and bagatelles to satisfy the demands of publishers and the need for income, and completing the Diabelli Variations. He was ill again for an extended time in 1821, and completed the Missa in 1823, three years after its original due date. He also opened discussions with his publishers over the possibility of producing a complete edition of his works, an idea that was arguably not fully realised until 1971. 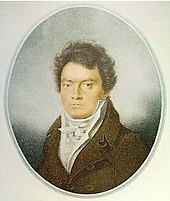 Beethoven’s brother Johann began to take a hand in his business affairs around this time, much in the way Carl had earlier, locating older unpublished works to offer for publication and offering the Missa to multiple publishers with the goal of getting a higher price for it. Two commissions in 1822 improved Beethoven’s financial prospects. The Philharmonic Society of London offered a commission for a symphony, and Prince Nikolay Golitsin of St. Petersburg offered to pay Beethoven’s price for three string quartets. The first of these spurred Beethoven to finish the Ninth Symphony, which was premiered, along with the Missa Solemnis, on 7 May 1824, to great acclaim at the Kärntnertortheater. The Allgemeine musikalische Zeitung gushed “inexhaustible genius had shown us a new world,” and Carl Czerny wrote that his symphony “breathes such a fresh, lively, indeed youthful spirit […] so much power, innovation, and beauty as ever [came] from the head of this original man, although he certainly sometimes led the old wigs to shake their heads.” Unlike his earlier concerts, Beethoven made little money on this one, as the expenses of mounting it were significantly higher. 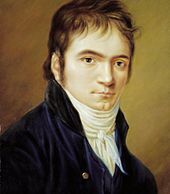 A second concert on 24 May, in which the producer guaranteed Beethoven a minimum fee, was poorly attended; nephew Karl noted that “many people have already gone into the country.” It was Beethoven’s last public concert. Beethoven wrote the last quartets amidst failing health. In April 1825 he was bedridden, and remained ill for about a month. The illness—or more precisely, his recovery from it—is remembered for having given rise to the deeply felt slow movement of the Fifteenth Quartet, which Beethoven called “Holy song of thanks (‘Heiliger dankgesang’) to the divinity, from one made well.” He went on to complete the (misnumbered) Thirteenth, Fourteenth, and Sixteenth Quartets. The last work completed by Beethoven was the substitute final movement of the Thirteenth Quartet, deemed necessary to replace the difficult Große Fuge. Shortly thereafter, in December 1826, illness struck again, with episodes of vomiting and diarrhea that nearly ended his life. 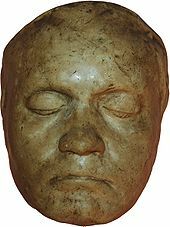 Unlike Mozart, who was buried anonymously in a communal grave (such being the custom at the time), 20,000 Viennese citizens lined the streets for Beethoven’s funeral on Thursday, 29 March 1827. Franz Schubert, who died the following year and was buried next to Beethoven, was one of the torchbearers. After a Requiem Mass at the church of the Holy Trinity (Dreifaltigkeitskirche), Beethoven was buried in the Währing cemetery, north-west of Vienna. His remains were exhumed for study in 1862, and moved in 1888 to Vienna’s Zentralfriedhof. There is dispute about the cause of Beethoven’s death; alcoholic cirrhosis, syphilis, infectious hepatitis, lead poisoning, sarcoidosis and Whipple’s disease have all been proposed. Friends and visitors before and after his death clipped locks of his hair, some of which have been preserved and subjected to additional analysis, as have skull fragments removed during the 1862 exhumation. Some of these analyses have led to controversial assertions that Beethoven was accidentally poisoned to death by excessive doses of lead-based treatments administered under instruction from his doctor. Beethoven’s personal life was troubled by his encroaching deafness, which led him to contemplate suicide (documented in his Heiligenstadt Testament). Beethoven was often irascible and may have suffered from bipolar disorder and irritability brought on by chronic abdominal pain (beginning in his twenties) that has been attributed to possible lead poisoning. Nevertheless, he had a close and devoted circle of friends all his life, thought to have been attracted by his strength of personality. Toward the end of his life, Beethoven’s friends competed in their efforts to help him cope with his incapacities. Sources show Beethoven’s disdain for authority, and for social rank. He stopped performing at the piano if the audience chatted amongst themselves, or afforded him less than their full attention. At soirées, he refused to perform if suddenly called upon to do so. Eventually, after many confrontations, the Archduke Rudolph decreed that the usual rules of court etiquette did not apply to Beethoven. Beethoven was attracted to the ideals of the Enlightenment. In 1804, when Napoleon’s imperial ambitions became clear, Beethoven took hold of the title-page of his Third Symphony and scratched the name Bonaparte out so violently that he made a hole in the paper. He later changed the work’s title to “Sinfonia Eroica, composta per festeggiare il sovvenire d’un grand’uom” (“Heroic Symphony, composed to celebrate the memory of a great man”), and he rededicated it to his patron, Prince Joseph Franz von Lobkowitz, at whose palace it was first performed. The fourth movement of his Ninth Symphony features an elaborate choral setting of Schiller’s Ode An die Freude (“Ode to Joy”), an optimistic hymn championing the brotherhood of humanity. Scholars disagree about Beethoven’s religious beliefs, and about the role they played in his work. It has been asserted, but not proven, that Beethoven was a Freemason. Beethoven is acknowledged as one of the giants of classical music; occasionally he is referred to as one of the “three Bs” (along with Bach and Brahms) who epitomise that tradition. He was also a pivotal figure in the transition from the 18th century musical classicism to 19th century romanticism, and his influence on subsequent generations of composers was profound. Beethoven composed in several musical genres, and for a variety of instrument combinations. His works for symphony orchestra include nine symphonies (the Ninth Symphony includes a chorus), and about a dozen pieces of “occasional” music. He wrote seven concerti for one or more soloists and orchestra, as well as four shorter works that include soloists accompanied by orchestra. His only opera is Fidelio; other vocal works with orchestral accompaniment include two masses and a number of shorter works. Beethoven’s compositional career is usually divided into Early, Middle, and Late periods. In this scheme, his early period is taken to last until about 1802, the middle period from about 1803 to about 1814, and the late period from about 1815. In his Early period, Beethoven’s work was strongly influenced by his predecessors Haydn and Mozart. He also explored new directions and gradually expanded the scope and ambition of his work. Some important pieces from the Early period are the first and second symphonies, the set of six string quartets Opus 18, the first two piano concertos, and the first dozen or so piano sonatas, including the famous Pathétique sonata, Op. 13. His Middle (Heroic) period began shortly after Beethoven’s personal crisis brought on by his recognition of encroaching deafness. It includes large-scale works that express heroism and struggle. Middle-period works include six symphonies (Nos. 3–8), the last three piano concertos, the Triple Concerto and violin concerto, five string quartets (Nos. 7–11), several piano sonatas (including the Moonlight, Waldstein and Appassionata sonatas), the Kreutzer violin sonata and Beethoven’s only opera, Fidelio. Beethoven’s Late period began around 1815. Works from this period are characterised by their intellectual depth, their formal innovations, and their intense, highly personal expression. The String Quartet, Op. 131 has seven linked movements, and the Ninth Symphony adds choral forces to the orchestra in the last movement. Other compositions from this period include the Missa Solemnis, the last five string quartets (including the massive Große Fuge) and the last five piano sonatas. In 1962, Walt Disney produced a made-for-television and extremely fictionalised life of Beethoven titled The Magnificent Rebel. The film was given a two-part premiere on the Walt Disney anthology television series and released to theatres in Europe. It starred Karlheinz Böhm as Beethoven. In 1994 a film about Beethoven (Gary Oldman) titled Immortal Beloved was written and directed by Bernard Rose. The story follows Beethoven’s secretary and first biographer, Anton Schindler (portrayed by Jeroen Krabbé), as he attempts to ascertain the true identity of the Unsterbliche Geliebte (Immortal Beloved) addressed in three letters found in the late composer’s private papers. Schindler journeys throughout the Austrian Empire, interviewing women who might be potential candidates, as well as through Beethoven’s own tumultuous life. Filming took place in the Czech cities of Prague and Kromeriz and the Zentralfriedhof in Vienna, Austria, between 23 May and 29 July 1994. In 2003 a made-for-television BBC/Opus Arte film Eroica was released, with Ian Hart as Beethoven and the Orchestre Révolutionnaire et Romantique conducted by Sir John Eliot Gardiner performing the Eroica Symphony in its entirety. The subject of the film is the first performance of the Eroica Symphony in 1804 at the palace of Prince Lobkowitz (played by Jack Davenport). In a 2005 three-part BBC miniseries, Beethoven was played by Paul Rhys. A movie titled Copying Beethoven was released in 2006, starring Ed Harris as Beethoven. This film was a fictionalised account of Beethoven’s last days, and his struggle to produce his Ninth Symphony before he died. The Beethoven Monument, Bonn was unveiled in August 1845, in honour of his 75th anniversary. It was the first statue of a composer created in Germany, and the music festival that accompanied the unveiling was the impetus for the very hasty construction of the original Beethovenhalle in Bonn (it was designed and built within less than a month, on the urging of Franz Liszt). A statue to Mozart had been unveiled in Salzburg, Austria in 1842. 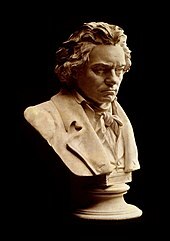 Vienna did not honour Beethoven with a statue until 1880. ^ Thorne, J. O. & Collocott, T.C., ed (1986). Chambers Biographical Dictionary. Edinburgh: W & R Chambers Ltd. p. 114. ISBN 0550180222. ^ White, Felix (1 April 1927). “Some Tributes to Beethoven in English Verse”. The Musical Times 68 (1010). ^ Ealy, George Thomas (Spring 1994). “Of Ear Trumpets and a Resonance Plate: Early Hearing Aids and Beethoven’s Hearing Perception”. 19th-Century Music 17 (3): 262–273. doi:10.1525/ncm.1994.17.3.02a00050. http://www.jstor.org/pss/746569. ^ Cooper (2008), pp. 194, 208–210. Cooper cites Solomon among other sources, and provides compelling evidence that it was neither Josephine Deym nor Marie Erdödy. ^ a b On 18 December 1818, The Landrechte, the Austrian court for the nobility, handed over the whole matter of guardianship to the Stadtmagistrat, the court for commoners ” It …. appears from the statement of Ludwig van Beethoven, as the accompanying copy of the court minutes of 11 December of this year shows, that he is unable to prove nobility: hence the matter of guardianship is transferred to an honorable magistrate” Landrechte of the Magisterial tribunal. ^ Mai, F.M. (1 October 2006). “Beethoven’s terminal illness and death”. J R Coll Physicians Edinb. 36 (3): 258–263. PMID 17214130. http://www.ncbi.nlm.nih.gov/sites/entrez?db=pubmed&cmd=DetailsSearch&term=Beethoven%27s+terminal+illness+and+death&log$=activity. ^ Jahn, George (28 August 2007). “Pathologist: Doctor Killed Beethoven”. The Washington Post. http://www.washingtonpost.com/wp-dyn/content/article/2007/08/28/AR2007082800980_pf.html. Retrieved 29 December 2008. ^ Eisinger, Josef (1 January 2008). “The lead in Beethoven’s hair”. Toxicological & Environmental Chemistry 90: 1–5. ^ Lorenz, Michael: ‘Commentary on Wawruch’s Report: Biographies of Andreas Wawruch and Johann Seibert, Schindler’s Responses to Wawruch’s Report, and Beethoven’s Medical Condition and Alcohol Consumption’, The Beethoven Journal, Winter 2007, Vol. 22, No 2, (San Jose: The Ira Brilliant Center for Beethoven Studies, 2007), 92-100. ^ “Festival de Cannes: Eroica”. festival-cannes.com. http://www.festival-cannes.com/en/archives/ficheFilm/id/4138/year/1949.html. Retrieved 9 January 2009. Solomon, Maynard (2001). Beethoven (2nd revised ed.). Schirmer Books. ISBN 0-8256-7268-6. Thayer, A. W.; Krehbiel, Henry Edward (ed, trans); Deiters, Hermann; Riemann, Hugo (1921). The Life of Ludwig Van Beethoven, Vol 1. The Beethoven Association. OCLC 422583. http://books.google.com/?id=VQw5AAAAIAAJ. Kerman, Joseph; Tyson, Alan; Burnham, Scott G. “Ludvig van Beethoven”, Grove Music Online, ed. L. Macy (accessed 29 November 2006), grovemusic.com (subscription access). Beethoven-Haus Bonn. Official website of Beethoven-Haus in Bonn, Germany. Links to extensive studio and digital archive, library holdings, the Beethoven-Haus Museum (including “internet exhibitions” and “virtual visits”), the Beethoven-Archiv research center, and information on Beethoven publications of interest to the specialist and general reader. Extensive collection of Beethoven’s compositions and written documents, with sound samples and a digital reconstruction of his last house in Vienna. Beethoven: The Immortal. Introduction and detailed account of the composer’s life. Articles include his deafness, demeanor, daily routine, medical history, final days, and letters. This entry was posted on 2 March 2011 by nanang basuki santoso. It was filed under Music and was tagged with Arts, Classical music, Ludwig van Beethoven.